Many self-employed individuals working as freelancers and professionals, as well as owners of micro, small and medium enterprises (MSMEs) in the Philippines dread the task of filing and paying their taxes because of the uncomfortably long amount of time to do it. Who can blame them? According to the World Bank and PricewaterhouseCoopers (PwC)’s “Paying Taxes 2018” report, Philippine-based businesses take an average of 182 hours a year to comply with tax regulations, including mandatory social and health insurance. In contrast, it only takes only Singapore businesses 64 hours a year to pay their taxes. Like their corporate counterparts, freelancers, professionals and small business owners not only have to file and pay annual income taxes but quarterly income taxes and monthly percentage taxes as well. Even if they don’t gross anything on a particular month, they still have to file the percentage tax return for that month. All these take a lot of time. However, large corporations, especially those with capital stock of at least Php10 million or belong to top 20,000 corporations by revenue, have the option to file electronically through the BIR’s Electronic Filing and Payment System (eFPS). This allows them to pay online through their banks’ respective Internet banking facilities. The rest of the taxpayers need to queue up at their banks to pay taxes though they can file their returns online through BIR’s second electronic filing platform called eBIRForms, which is essentially an online tax preparation software. It allows taxpayers to fill up tax forms online, or to download or print the forms and fill them up offline. Either way, eBIRForms can’t be used to pay taxes online. Taxpayers still need to go their banks and pay taxes over the counter. Related story: Are You Covered by the BIR's Electronic Filing and Payment System (eFPS)? Thanks to tie-ups forged by the BIR with government banks Land Bank of the Philippines and Development Bank of the Philippines, the convenience of paying taxes online enjoyed by large taxpayers is now available to freelancers, professionals and small business owners who are not qualified for the BIR’s eFPS platform. 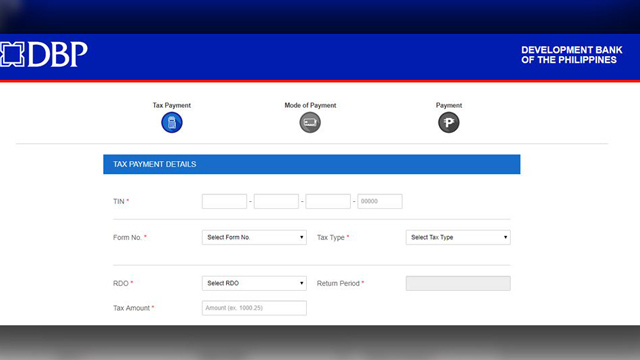 Last October 19, the Development Bank of the Philippines launched its online payment facility, DBP PAYTAX ONLINE, that allows taxpayers to settle their tax payments with their credit, debit and ATM cards issued by Bancnet, the Philippine-based multi-bank and multi-channel electronic payments network. “This is the first facility to allow tax payments using credit cards which are non- proprietal, meaning it's not just limited to DBP account holders paying for their taxes,” said Ricardo Josef Bandal III, DBP vice-president and head of transaction banking department. “Essentially the platform would allow them to use any of their Bancnet (ATM cards), and Visa or Mastercard (credit cards). “Our target here is really the small taxpayers because the large taxpayers are not using this. They are already enrolled in eFPS. That’s a separate online facility. This one is more for the individuals, professionals, small proprietors and for those one tax payments like capital gains,” he added. By opening up its portal to holders of Bancnet ATM cards and Visa and Mastercard credit or debit cards, the DBP facility greatly expanded the potential beneficiaries to practically everyone with an ATM card as well as credit or debit card. While the BIR has allowed the use of credit and debit cards to pay taxes since 2016, individual taxpayers can only use them when paying over the counter at the bank. Earlier last month, on October 12, the Land Bank of the Philippines launched the Link.BizPortal, a payment facility that allows Landbank account holders to pay their taxes through the internet. Landbank CEO and President Alex Buenaventura said the new online payment facility for Landbank account-holding taxpayers will reduce the hours spent queuing at LBP branches for those paying their taxes. For first nine months of this year, Landbank has served some 4.5 million taxpayers who were making over-the-counter payments at Landbank branches for their tax dues, he said. “Last April (during the tax filing rush), the lines were long, and some had to wait six hours to be served by the tellers. Now they only have to access the internet,” Buenaventura said on the sidelines of the launch of the e-payment portal last October 12. For now, Landbank’s Link.BizPortal is available only to Landbank deposit account holders. Savings accounts can be opened and maintained for Php100. Payment of taxes through the portal is free of charge. Taxpayers using DBP PAYTAX ONLINE will be charged Php35 plus two percent of the total tax amount for credit card payments. Tax payments using ATM or debit cards are charged only Php35. Both banks are set to expand the capabilities of their respective online tax payment facilities. Landbank will include Bancnet-issued credit cards in its online payment facility for taxpayers before the end of the year. Meanwhile, DBP is set to launch an online payment mechanism that will allow taxpayers to make payments at selected retail merchants by the first quarter of 2018. 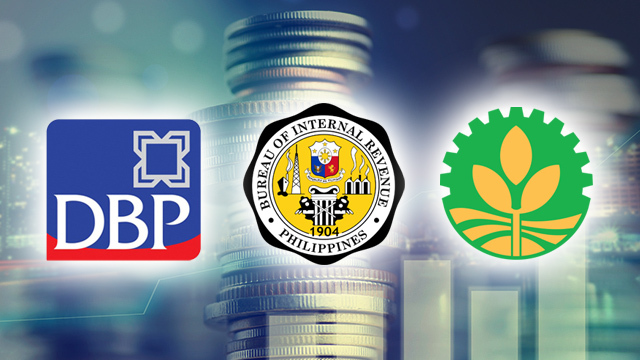 BIR officials explained that the launch of DBP and Landbank’s online tax payment portals helps expands the usefulness of eBIRForms, the agency’s’ electronic tax filing platform for small and individual taxpayers. Previously, those who used eBIRForms can settle their taxes through over-the-counter payments at accredited agent banks (AABs), and mobile phones with Globe Telecom's mobile money service, GCash. “Now, there’s another payment facility online. You can file the forms and pay online through GCash, and this time, ATM and debit card payment can be done. Just click ePay icon and choose Landbank, DBP or GCash,” explained Lanee Cui-David, BIR deputy commissioner for the information systems group. She added that there are other online tax payment facilities to be launched before the next tax filing season in April next year.